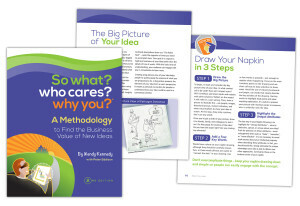 Step-by-Step Tool Guidance - wendykennedy.com inc. The heart of the So what? who cares? why you? methodology has always been the visual tools. In this second edition, you’ll continue to see the same rich visual tools but with a refreshed and revitalized personality. We’ve trimmed down the toolset to focus on 14 visual tools versus the original 23 tools and worksheets. Why reduce the number of tools, you ask? In this case, “Less is More” – we’ve put a lot of effort into streamlining the tools in the methodology to have only those that shape and mold early stage ideas. This focus gives innovators a rich suite of tools to explore, model and map the value of their ideas. Step by Step Guidance – So what? who cares? why you? is about engaging with the tools to discover the business value of an early stage idea. To do this effectively, the second edition provides step-by-step tool guidance so users can implement the best practice for each tool. These steps are clear and concise and one-page and one page in length, in keeping with the WKI values of simple, yet powerful. This feature in the second edition is designed to allow users to harness the full power of the methodology. It will also allow for deeper exploration of the commercial potential of their ideas and spark new and exciting conversations with supporters about the commercial opportunity for their ideas.